Ceramide, Hyaluronic Acid, Beta Hydroxy Acid; a few years back, we wouldn't be much interested, in any product displaying the name of any of these as the main ingredient on their packing, and that too in bold texts; but today, more and more consciousness is being developed around certain chemicals which are actually very beneficial for the health and appearance of our skin. 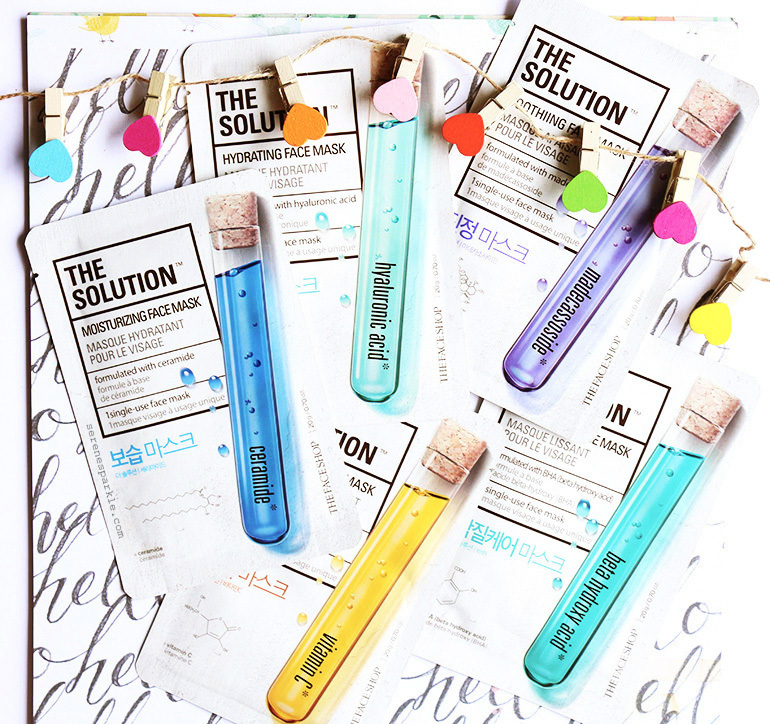 And that's the reason why I was intrigued about 'the solution' sheet masks from the face shop in the first place. Also, If I can give a little credit to their aesthetically pleasing cover packing as well. The overall design and packaging look even more enticing when you have them in front of your eyes, and I remember I didn't want to tear and throw away the packing but sadly, that's the only way to use these sheet masks. Besides having a pretty outer packing, all the sheet masks have a thin plastic film covering, which needs to be removed before placing the mask on the face. The thin cotton sheet masks, fully drenched in a good amount of serum, adhere to the skin nicely, giving you a feel of an absolute skin pamper session! Always place a sheet mask on a cleansed skin, or if you're beginning to indulge your skin in a multi-step Korean skincare routine then you should be using a sheet mask after getting over with your double cleanse, toner, emulsion and a serum. There are a maximum 11 steps in Korean skincare routine and this long routine may sound like a tedious task but looking at the glowing and healthy skin of the Korean women, I think we all will agree that it's totally worth the effort. My skin didn't wait for the super chilly weather to arrive and turned a little sensitive and dry since the onset of October, so I was particularly excited about trying the hydrating and soothing sheet masks. Beginning with my favourite from the range, the soothing, the madecassoside sheet mask, it was the first mask that I tried out of all the five and I instantly fell in love with. I did not even have the slightest idea that my skin would love it so much. The ingredient madecassoside is derived from the plant Centella Asiatica. It is known for its healing, soothing, anti-inflammatory and collagen boosting properties. Also, it has a very nice pleasing scent. Post masking, I could feel the instant relief on my skin delivered by this mask. It's very calming and soothing. It cures any irritation and sensitiveness caused by dryness on your skin. And If I had to suggest any sheet mask to stock up in your skincare stash this winter, it would be this one! Now coming to the other two moisturising and hydrating sheet masks (Ceramide and Hyaluronic Acid); being in this beauty blogging world and reading about makeup and skincare on so many blogs, I did gain some information about the benefits of hyaluronic acid for the skin but I didn't know about ceramides. Hyaluronic acid is a molecule found naturally in our body and it attracts up to 1000 times its molecular weight in water but it depletes as we age and that's the reason why this ingredient is important for dry, dehydrated skin. Ceramides, on the other hand, hold skin cells together and are found in the skin's outer layer. They form a protective layer and hold skin's moisture level. Unfortunately, ceramides also decline as we age and this results in dryness and roughness of the skin. Both ceramide and hyaluronic acid kinda fall in the same category which is 'moisturizing' and I already had high expectation from the hyaluronic acid one but if you ask me to compare, I'll have to say that the ceramide sheet mask outshines the hyaluronic acid one; Yes! I didn't find the hyaluronic acid sheet mask as effectively moisturizing as the ceramide one. The ceramide sheet mask felt so amazingly moisturising and hydrating on my skin and so, it has now become my second favourite. There was not a single trace of dryness on my skin after using this sheet mask and the effect lasted till the next day (I used it in the night time). The hyaluronic acid sheet mask is decently hydrating and I'd recommend it to people with normal to dry skin only. If you suffer from extreme dryness then the madecassoside and ceramide would be more wonderful and healing for your skin. We all know the benefits of Vitamin C, especially for dull and pigmented skin, so a sheet mask infused with its goodness is what all you need to instantly brighten up your complexion. This sheet mask has an uplifting citrus-y scent, which makes the whole 20 minutes of having this mask on, a really nice experience. It did brighten up my tired and dull skin along with adding a glow. Although it's not very long lasting, I will still highly recommend this sheet mask if you're looking for something that'll give your complexion a quick brightening boost. And finally, coming to the last or perhaps I should say, the least impressive mask out of all the five, the beta hydroxy acid sheet mask. As it's written on the packaging, it is a smoothing mask but it didn't leave my skin feeling smooth at all. In fact, I found the serum in this particular sheet mask, a bit sticky on my skin and the scent isn't nice either. This sheet mask was a disappointment and it just didn't suit my skin. Barring the beta hydroxy acid sheet mask, I have enjoyed using the face shop the solution sheet masks. 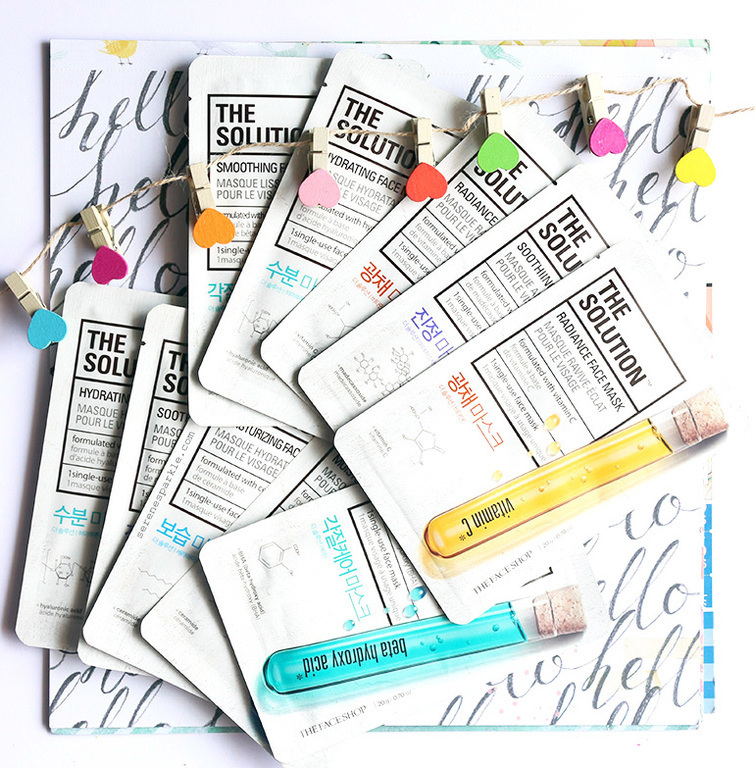 There are a total of ten sheet masks in the solution range, I have only tried five of them. And out of these five, I will definitely repurchase the madecassoside, ceramide and Vitamin C one. So, are you tempted to try out these sheet masks from the face shop?